Anticipation of KODA's arrival is further heightened by the unparalleled renaissance taking shape in the International District and along Seattle's waterfront. The downtown shoreline of Elliott Bay, one of Seattle’s oldest neighborhoods stretching back to the late 1800s, is undergoing a major face-lift that will embrace and celebrate the city’s past, present, and future. The Waterfront Seattle program, which spans the waterfront from Seattle’s historic Pioneer Square neighborhood to Belltown, will relocate Highway 99 into a new deep bore tunnel and remove the Alaskan Way Viaduct in 2019 setting the stage for a collection of waterfront improvements. "The waterfront transformation is a game-changer for both Pioneer Square and the International District," said Dean Jones, President and CEO of Realogics Sotheby's International Realty, the listing firm representing KODA Condominium Flats. "For the first time in more than a century these communities will have a greater connection to Elliott Bay and our waterfront will evolve from a working port separated by a noisy concrete divide to be a world-class amenity for quiet enjoyment by local residents and visitors alike." Jones believes Seattle will soon have a waterfront experience that will rival West Coast peer cities like Vancouver, BC and San Francisco. "It's easy to see the benefit that provided to nearby residential enclaves," adds Jones. "I believe our homebuyers at KODA are perfectly positioned." In 2017, the City of Seattle completed major elements of the Elliott Bay Seawall Project, replacing the aging, failing seawall along the waterfront and improving the lost nearshore environment. The new seawall improves the salmon migration corridor, meets current seismic standards, and will act as the foundation of Seattle’s future waterfront. As part of the project plans, a newly built Pier 62 will offer steel support piles and a textured concrete platform deck—two alterations that will improve the structural safety and integrity of the pier and the marine habitat below. 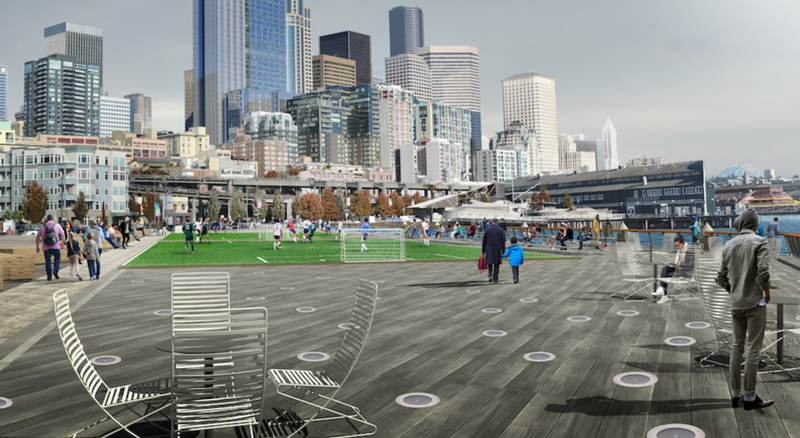 Additionally, Waterfront Seattle will install a new railing, build a floating dock for public use, add utilities to support public events and install solar-powered LED lighting into the deck. In addition to the waterfront project, the Downtown Seattle Association is working on updates to two of Seattle’s most iconic areas: Pike Street right in front of the market and the open-area park on Occidental Avenue in Pioneer Square. This change represents part of a multi-year effort to improve the pedestrian experience and connect Pike and Pine to the waterfront. Pike Place Market, a site built for producers in the early 20th century, is extending its space for farmers and producers, providing a dynamic public plaza with views of Puget Sound and Olympic Mountains, table space for farmers, craftspeople and artisan purveyors, retail space, low-income housing, a neighborhood center and parking. For Pioneer Square, the association aims to add a park and a timber pavilion to the brick area on Occidental Square between Main Street and South Jackson Street. The activation of Occidental Square Park, beginning in 2015, has galvanized significant interest in the park. Two separate initiatives are moving forward. The first is a children’s play area. The second is a new Timber Pavilion and concierge station. PICTURED ABOVE: The MarketFront completes the historic district after more than 40 years of study and planning. Its design and use were created in accordance of Market historic district guidelines and the Pike Place Market charter. PICTURED ABOVE: The rehabilitation and update to Pier 62 by the City of Seattle, through its Office of the Waterfront, is part of its overall strategy in creating a central public open space area along the central waterfront. After the new 99 tunnel opens to drivers, the Alaskan Way Viaduct along Seattle's waterfront will be removed to make way for a new surface street built by the City of Seattle. This project will help transform Seattle’s waterfront while removing a vulnerable structure from our road network. PICTURED ABOVE AND BELOW: Alaskan Way Viaduct and Highway 99 tunnel. After the tunnel is finished, crews will close the Alaskan Way Viaduct for several weeks to realign the highway to the tunnel.